Do you have a friend who lives with a chronic illness? 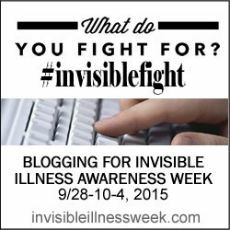 Is someone you care about going through a daily invisible fight? It is easy to want to help a friend, but it can be hard to know how to help a friend who is facing a battle that you don’t understand. 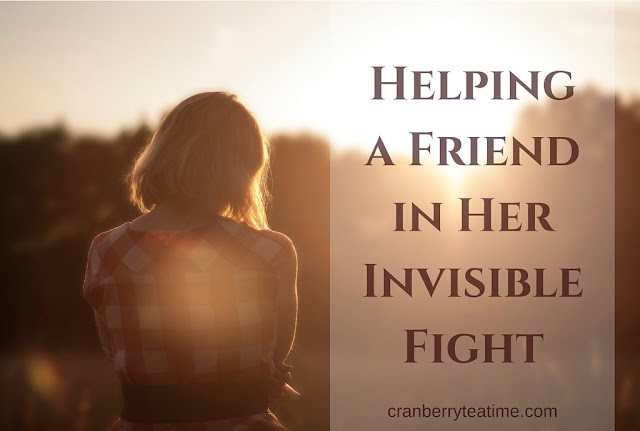 Here are a few ways that you can reach out to your friend and help her in the invisible fight. Communicate with her. Let her know that she isn’t alone. Let her know that you see her and that you care. There are plenty of ways to communicate that will accommodate your friend’s limitations and needs. It might be helpful to ask your friend what methods of communication are best for her. Send text messages. These can be short to let her know that you are thinking of her, or if she is up for it, you could have a conversation through text messages. Send an email. Share about your life, and ask her about her life. Email can be an easy way for someone with a chronic illness to get to know a new friend or connect with a long-time friend. Connect with her on social media. Interact on Facebook and Instagram so that you can be a part of her life, even if it is only virtually. Read her blog, and leave comment or let her know that you are reading it. Send a card in the mail. Cards are extra-special because of the time required to handwrite and send a card. They are also special because they can be kept, held, and displayed for continued encouragement. Visit your friend. Spending time with a friend is time well spent. An in-person visit allows you to give your friend a hug, see how she is doing, and provide fellowship that she might not otherwise have. Call your friend on the phone. If you are unable to visit, it may be very encouraging to your friend to hear your voice over the phone. Get to know her better. Ask her what her daily life is like so that you can understand her invisible fight. My friend, Stacey, has some good questions in this blog post that you can ask your friend. Pray for her. Pray that she would not grow weary and lose heart. Pray that the Lord would strengthen her spirit. Pray that she would be faithful to the Lord as she suffers physically. Pray that the Lord would provide for her needs. Pray that she will grow in godliness. Pray for encouragement and strength for her family. Encourage her. Encourage her to persevere. Share a passage of Scripture that has encouraged you. Tell her what you have learned from her example. Tell her about the godly qualities you see being developed in her life. Encourage her through words, visits, gifts, and/or offering practical help. Let her know that you want to be her friend in the good days and the bad days. A gift could also be something to bring comfort such as a throw blanket, a sweater, or flowers, or something to keep her occupied such as a Netflix subscription, a movie, or a simple craft kit. Offer practical help. Sometimes your friend may need physical help in fighting her chronic illness. She may be physically unable to keep up with cleaning. She may need help getting to the doctor or picking up medications. She may need help preparing healthy food. She may need someone to take care of her children for a while so that she can get the rest her body needs. It might not be helpful to give a general offer of help by saying, "Let me know if you need anything." Your friend might not know what you are comfortable doing, or able to do, so she might not know what to ask for. She also might not even be able to think of what would be helpful. Spend time with your friend so that you can see areas of need, and then offer to help in a specific way. These are just a few ways that you can help a friend as she faces the invisible fight of chronic illness. If you want to read more about how you can help your friend, you may find my ebook, Chronic Illness and Friendship, to be beneficial. It is available for free as a PDF document. Thank you for caring about your friends who are ill and for loving them in the hard places of chronic illness. May the Lord bless you as you bless your friend through your caring and friendship! Photo Credit: black and white image from ErikSöderström.